Qualifying or not, this is a weak area for Charles. According to recent analysis by Motorsport based on 2018 qualifying performances, Leclerc was struggling to put sectors together in many Q3s and Vettel on the other hand was statistically the best driver in putting together all sectors in Q3. Leclerc needs to work in this area as it could make a big difference in Q3 when teams are only separated by few tenths. Yeah there was analysis on his Qualifying, during that phase it was reported that he used to hook up his tyres in the final sector & was best in the middle part. So he needs to focus on it. I just wonder at some tracks if he pushed too hard for example in sector 1 then by the time he approached the final sector there's no tyre life left and vice versa. so do you guys think Ferrari doing a new spec engine for this year may have take that into account and designed in in such a way that is not fumigating as it was????? Good lap count from Ferraris so far. 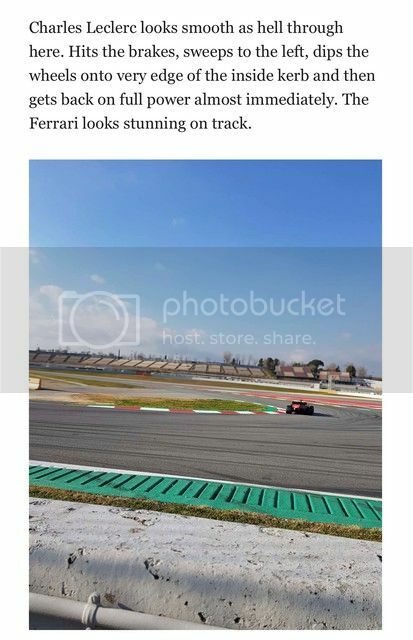 I know ts testing, but the time Vettel set on day 1 of testing bodes well. once we refine the car and optimise it. We should knock off a number of tenths from that lap time. I doubt Vettel done a quali sim on the very 1st day. Heya if it's the white "oil burner" smoke then no. It was the 1st thing i looked for when they exit the garage. Just the normal heat glare from the exhausts, nothing else. one thing is for sure, Ferrari has forced Mercedes hand into re-designing their engine which in the long run might be an advantage for us due to early teething and reliability issues they might experience until they rack up mileage. I just hope our guys capitalise on every point the Mercs let slip. Saw this on the F1technical thread... Thought it was funny. Almost 300 laps for Ferrari engine cars. 140 Leclerc. Fantastic. I think they're referring to the Campbell's tomato soup color. I find it funny and kind of endearing, especially since the car looks to be a favorite right out of the gate. I think they're referring to the Campbell's tomato soup color. I find it funny and kind of endearing. That's day 2. Looking good for Ferrari so far. Lets see how the rest go. I am optimistic! Plenty of data for Ferrari engineer's to go through. Another solid day of testing. "The car looks balanced, it looks good to drive. The fast corners, the slow corners... so far, dare I say it, it doesn't look to have a weakness." Good to hear. SF90 reminding me of Red Bull RB7, no understeer and planted rear end. Without getting too carried away with excitement, it's a real tonic to see Charles on top today and Seb yesterday, along with strong showings from Antonio G and Kimi in the Alfa with the Haas cars pretty close, this is just the encouragement we need to build on and it's definitely looking promising. 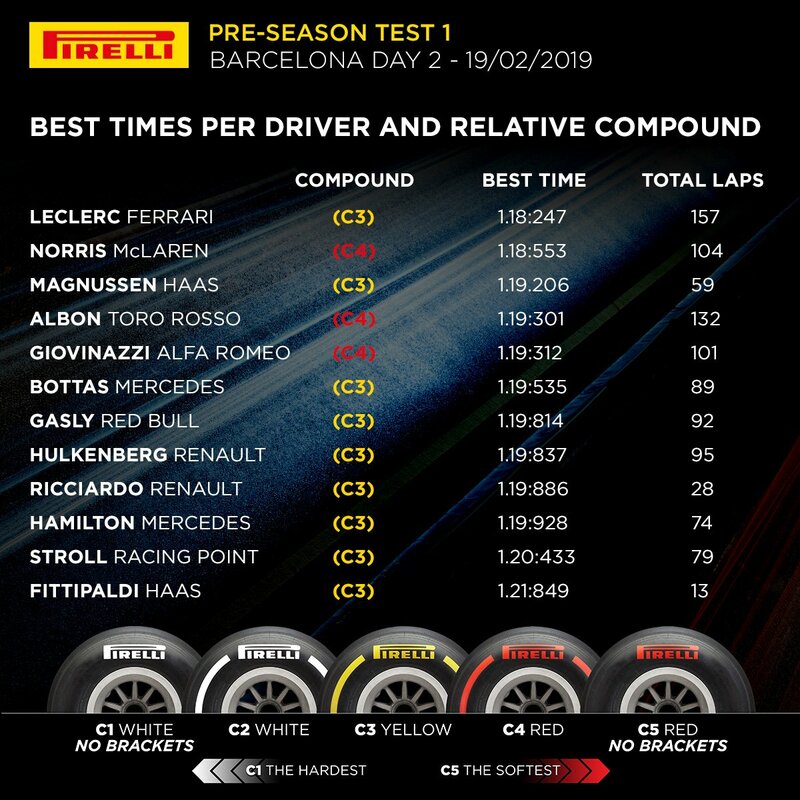 Looks like another trouble-free testing day by the amount of laps Leclerc did. Great! I can't follow the testing all the time during the day so I have to read up on it later. I noticed Leclerc posted a higher speed trap time than Seb yesterday with almost the same lap time (low 1:18) on the same compound (C3). So he probably ran less downforce than Seb. I guess the sweetspot should be somewhere in between today's and yesterday's setup in order to post a high 1:17 time. I think we'll see that eventually if the weather stays the same. If not at the this test then at the second one later. But the most important thing is for the reliability and cooling to work flawlessly. [Autobild] Vettel has done it yesterday and Leclerc has done it today. Both of them have been lifting in S3, not showing the full potential of the car. There is much more in the SF90 but Ferrari is playing. And that‘s why Vettel is so confident. I was reading about that too. A lot of pundits were saying that Charles needed to improve in T3 but failed to notice that him and Vettel were both actually lifting in the final sector and nothing to do with the car not being good in that part of the track or the driver needing to do better. Ferrari are sandbagging in their own way.